Although the MR2 (SW20) is known as a high performance machine with its characteristics of a mid engine, rear-wheel drive layout, but retains a lot of weak points. This well balanced MR2 was built by Phoenixfs Power with speed and stability in mind. The owner wanted to try a variety of engine setups by switching between numerous turbos and ECU settings. This time the motor was mated with a T04R turbine that outputs 620 horses. Full throttle pulls with a secure rear end!! Let's face it; driving an MR2 is not my thing...MR2s have a distinct way of handling because of its midship engine layout and specially the high powered ones are very difficult to master. However, this 600 horsepower MR2 is built very well. The power overflows from 5000 rpms and on, but the rear end stays very stable even at 3rd gear full throttle pulls. The traction is amazing on this car. Although I could only test it up to 5th gear at full throttle because of the rain, this car remained stable all the time. The handling feeling is plentiful and very calm. This is because of the great suspension setting. All the tuned MR2s in the past were sufficient in terms of power but lacked a good suspension setup. This car is not the case. The tuning has evolved. After driving this car, I now understand why the owner is so passionate about it. The 2.2L bored and stroked 3S-GT with a fully tuned head accompanied with a T04R turbine is good for 620hp @ 1.8bar! In the bottom end was stuffed with custom forged pistons, H-beam connecting rods, and a custom crankshaft made for the 5F. The 2163cc displacement comes from the 87mm (3.425") bore and 91mm stroke. The head assembly is all Phoenix Powers original parts, and the intercooler was moved to the trunk. The T04R was installed just for this article coverage. This turbo is good for 618ps (609hp) and 56kgm (405lb-ft) of torque all controlled by the Apexi Power FC. On the previous setup, the owner of this MR2 had a T51R SPL BB with an FCon Vpro that produced 777ps / 71kgm (766hp / 513lb-ft) with max boost 2.5kg/cm² (35.56psi). The custom camshafts have 272 degree duration with 11.5mm lift on the intake side and 282 degree duration with 11.5mm lift on the exhaust side. To install these camshafts, some work on the cylinder head was necessary. Also, the valve springs, the retainers, and the lifters were also customized and installed just for these camshafts. The custom catalytic converter contains a 150 metal honeycomb cells. For this vehicle, the catalytic converter (on the right on the picture) was welded to the exhaust system without its case (on the left on the picture). Due to more power and response at the mid to high RPM, an Infiniti 90mm throttle body was installed. The intake piping is 80mm (IN) and 90mm (OUT). The exhaust is all custom: 85mm main section and a 115mm tip. The exhaust splits into two, and the muffler looks very mean from the rear. The 16 row oil cooler rests beneath the license plate. The custom suspension kit was based off Ohlins components, requiring special modifications to make them fit on the MR2. Using a set of DR21 kg/mm springs, this amazing setup provides great traction, handling, and ride quality. The front lower control arm, the tension rods, the tie rod ends, the rear lower arm, the torque control arm are custom components too. These brakes were fabricated to match the vehicle power output. The front stock brake rotors and calipers were adopted from a JZA80 4-pot system. Along with a set of brake pads from Image, this combination produces absolute braking power and control. The stock cluster was replaced with a TRD unit good for 300km/h and next to it an Apexi 10,000RPM Tachometer was installed. The three gauges (boost, oil temp, and ex. temp) were mounted on the dashboard while the other three gauges (oil press, water temp, and fuel press.) were mounted on the center console. Although the boost can be regulated with the Apexi Power FC, they installed a Blitz Dual SBC because of its various programmable boost settings. Next to the Blitz Dual SBC, Apexi Rev/Speed meter with multi-functions (speed meter, RPM, 0-400km/h, and so on) was mounted. 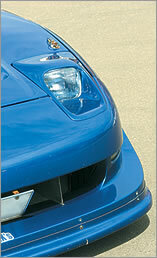 The custom engine hood scoop is designed to extract the hot air out of the engine room. The custom trunk air duct is designed to inject the cold air into the trunk where the intercooler sits. The whole system was not only designed for functional purposes, but also for appearance. The custom front bumper spoiler with fixed headlight kit gives the car that distinct look. The lip spoiler is adjustable for any given condition. The Border hood with air ducts pulls the air through the radiator and out to the top of the body.